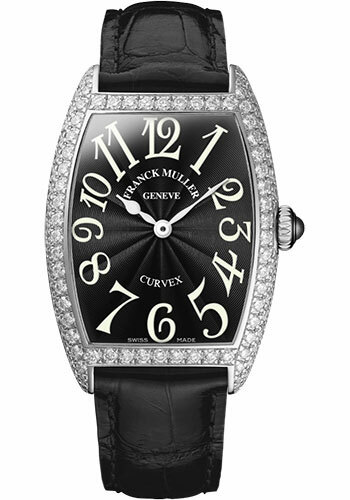 29.00 mm x 39.00 mm platinum case set with diamonds, black dial with white Arabic numerals, 7502 QZ quartz movement, approximately 2 years of power reserve, black hand-sewn alligator strap. Water resistant to 3 atm. 29.00 mm x 39.00 mm platinum case set with diamonds, blue dial with white Arabic numerals, 7502 QZ quartz movement, approximately 2 years of power reserve, blue hand-sewn alligator strap. Water resistant to 3 atm. 29.00 mm x 39.00 mm platinum case set with diamonds, bronze dial with white Arabic numerals, 7502 QZ quartz movement, approximately 2 years of power reserve, brown hand-sewn alligator strap. Water resistant to 3 atm. 29.00 mm x 39.00 mm platinum case set with diamonds, grey dial with white Arabic numerals, 7502 QZ quartz movement, approximately 2 years of power reserve, grey hand-sewn alligator strap. Water resistant to 3 atm. 29.00 mm x 39.00 mm platinum case set with diamonds, pink dial with white Arabic numerals, 7502 QZ quartz movement, approximately 2 years of power reserve, pink hand-sewn alligator strap. Water resistant to 3 atm. 29.00 mm x 39.00 mm platinum case set with diamonds, red dial with white Arabic numerals, 7502 QZ quartz movement, approximately 2 years of power reserve, red hand-sewn alligator strap. Water resistant to 3 atm. 29.00 mm x 39.00 mm platinum case set with diamonds, white dial with black Arabic numerals, 7502 QZ quartz movement, approximately 2 years of power reserve, black hand-sewn alligator strap. Water resistant to 3 atm. 29.00 mm x 39.00 mm platinum case set with diamonds, white dial with black Arabic numerals, 7502 QZ quartz movement, approximately 2 years of power reserve, brown hand-sewn alligator strap. Water resistant to 3 atm. 29.00 mm x 39.00 mm platinum case set with diamonds, white dial with black Arabic numerals, 7502 QZ quartz movement, approximately 2 years of power reserve, orange hand-sewn alligator strap. Water resistant to 3 atm. 29.00 mm x 39.00 mm platinum case set with diamonds, white dial with black Arabic numerals, 7502 QZ quartz movement, approximately 2 years of power reserve, purple hand-sewn alligator strap. Water resistant to 3 atm. 29.00 mm x 39.00 mm platinum case set with diamonds, white dial with black Arabic numerals, 7502 QZ quartz movement, approximately 2 years of power reserve, red hand-sewn alligator strap. Water resistant to 3 atm. 29.00 mm x 39.00 mm platinum case set with diamonds, white dial with black Arabic numerals, 7502 QZ quartz movement, approximately 2 years of power reserve, white hand-sewn alligator strap. Water resistant to 3 atm. 29.00 mm x 39.00 mm platinum case set with diamonds, white dial with black Arabic numerals, 7502 QZ quartz movement, approximately 2 years of power reserve, yellow hand-sewn alligator strap. Water resistant to 3 atm.